Was watching the DNC last night and the tapes from the day before and started to think that the problem with the DNC goes beyond what we talk about - money, corruption, keeping people out. I took pride in being a Democrat my entire life. I fought for Kennedy, and Obama, Johnson, Robert Kennedy, Carter. The party itself is also made up of civil rights superstars and the convention itself is filled with people the party has advocated for - people with disabilities, poverty, absent social justice. So why did the parade of the vulnerable bother me? Why was my pride and spirit not raised? So I began to think about the super stars - Barney Frank, Lewis, Cummings, the Clintons, whomever, and I wondered... They are all my age or older. Their issues are issues that permeated and defined the sixties. They made Change, were social and cultural warriors. They formed a team, a group of warriors who bonded themselves to the cause. Think about that. Fifty to sixty years dealing with social issues successfully? They come to rely on each other, trust each other. They covet their power to define what issues get covered, who is meaningful and whom is not. They became institutionalized. Though they continue to fight the good fight, they became a closed system. And they fail to see how the world has changed. They fail to see they have narrowed the field of interest by aging commitments. The tower is no longer a tree. All fluidity is absent. The focus is to keep us going. And exclusion rather than inclusion becomes increasingly the order of the day. So, here we are today. Corporatism is not an issue despite its ties to the party structure. Black Lives Matter is not an issue because All Lives Matter since we've been recognizing and handling civil rights issues for years. And the money we were grateful for to keep us going has become the money we demand to keep us going. The danger of this televised truly Orwellian evangelical parade of the saved--disabled, women, people of color that marches across the screen like Jerry Lewis's Muscular Dystrophy patients--is that all these wonderful people have become the "objects" of the Dems intention and the visual proof of the demonstrable power they have to save you. They are all too invested. They need to find a way to become inclusive and alive to new issues. They are like that line from Fitzgerald describing Gatsby himself: "He was a son of God—a phrase which, if it means anything, means just that—and he must be about His Father’s business, the service of a vast, vulgar, and meretricious beauty." I cant believe I am at the same convention that the press was. Don't trust anything on the mass media. It's all stacked against Bernie. He was not booed this Monday afternoon. His comment was about supporting Hillary but that was not booing him. The crowd was not raucous. It was loving and energized and calmly and deeply appreciative of him. He did not struggle to get the attention to start speaking. He was humbly recognizing our reception. There as no unruly outbursts at all. There was no contention.There was some disagreement, but not chaos as media has suggested. More later. Protesters at the fence leading to the Wells Fargo convention area. Protesting the Confederate (Mississippi state) flag hanging along Broad Street. We Are Seeing YOU in Philly! We've made it to Philadelphia--along with many thousands of other Berners! It's been a long and very exhausting first day (with record high temps) so the writing will come later. For now, enjoy some photos of some of the excitement we witnessed on the streets and in FDR Park today. We witnessed the Clean Energy March and some of the rally in the park. Alas, Bernie wasn't there. Word on the street says that we could see him Monday, so we're holding onto that hope. You can watch many events and marches on Political Revolution TV this week, so we encourage you to do so. You might even see us on You Tube at PRTV. If so, sign in and chat with us live or leave a comment if you catch us after the fact. DemocRATS are making this "rat" angry. He says "Write-in Bernie." Philly is a big place and we're not sure what all is going to happen and who we'll bump into, so sit back and enjoy the ride with us. #OurRevolution has begun in earnest. Power to the people! Sally, a 92 year old Bernie delegate from New Mexico, sang us an original tune at the rally in FDR Park. Awesome! My friends and political activists. Receiving this message from me means you made it to the select list of those who will be getting regular feedback from the delegation. As unfiltered the mainstream media. As a Bernie delegate I will do my best to convey what I see and hear during the DNC convention. As a scientist I will do my best to be objective ( but that is virtually impossible in the political realm). If at any time you would like to not get these or comment on these, let me know by reply. Here we go! already we have challenges going in: VP pick is not sitting well with many Bernie people. 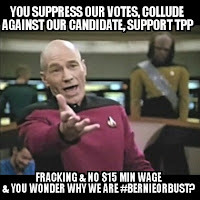 superdelegates may not be eligible to vote, TPP is hottest issue, may get minority mic time. Attorney general just got notice that Clinton campaign interviened in the election process, biases in DNC in Hillary leaks are breaking news. Realize anything can happen here. Especially with information technology like never before. A Berner who brought his llama to talk about the treatment of farm animals. Yes, that's an actual llama in the middle of downtown Philadelphia... Berners go the extra mile to get their message out! Feelin' the Bern indeed! Don't leave yet! 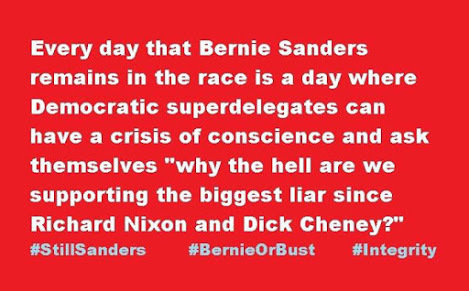 Bernie hasn't conceded, people. As per DNC rules, a candidate with an active campaign is not allowed to deny an endorsement of another campaign. Doing so would result in forfeiture of said candidate's superdelegates, and the loss of access to the convention floor stage. 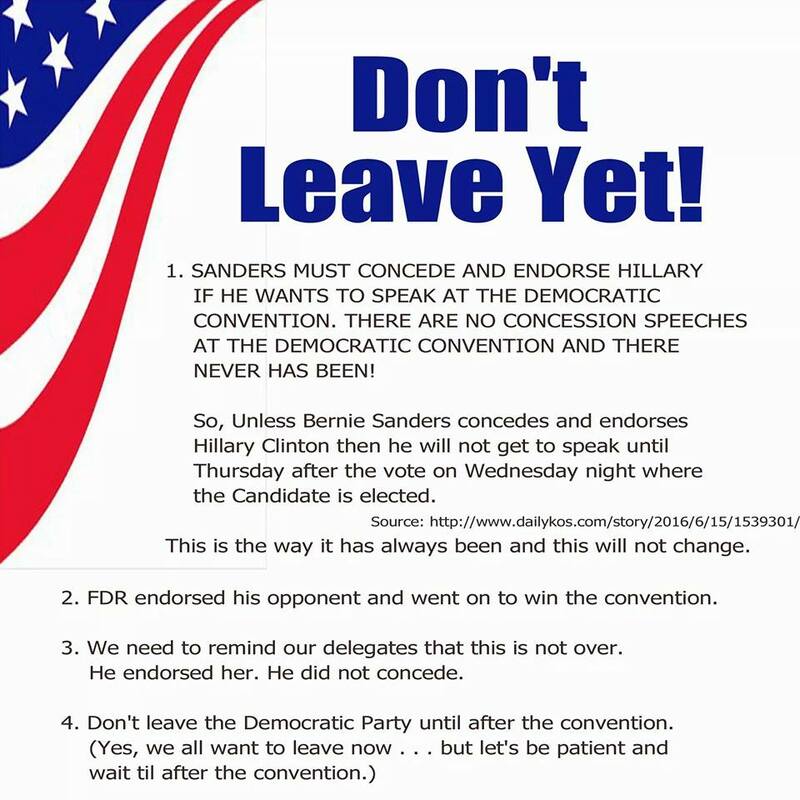 Bernie is not conceding, folks! He has to play the game by the DNC's rules which state he wouldn't be allowed to take the podium at the DNC convention and his delegates wouldn't be allowed in if he didn't "endorse the frontrunner." (Those are the DNC's rules!) His campaign hasn't stopped--he didn't say "I quit/concede." Listen to what he said--he says we're going to the convention and we are. Have faith and read up on history: FDR in 1932 won a contested convention like this one. FDR "endorsed" his opponent on the first ballot and, four ballots later, he was nominated. FDR went on to win by a landslide--and won the presidency four times. So, don't panic. 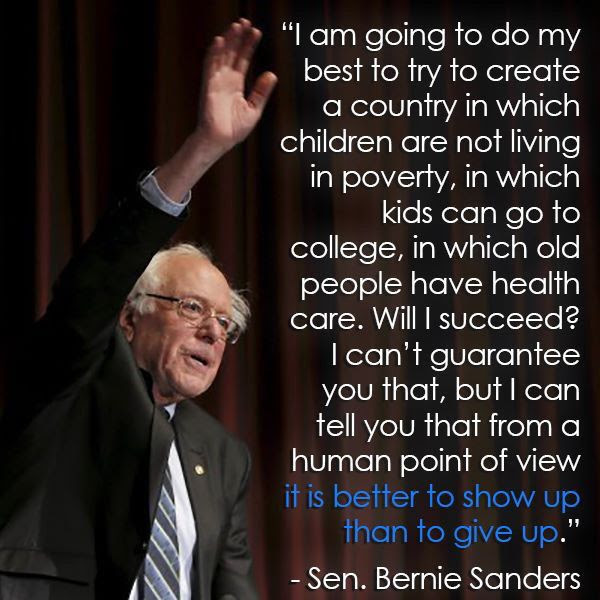 Stay the course and #feelthebern. You must come to understand that the nature of politics is to subtract meaning from language. Although Bernie Sanders is a statesman, he's still a politician. Have a bit of patience, and wait for Bernie Sanders to make his case at the Democratic National Convention. By "endorsing" Hillary Clinton, Sanders is actively preserving his options and buying time. Q: Bernie can actually still win?? Read this blog, and I guarantee you'll feel better: Ignore the mainstream media gloating. 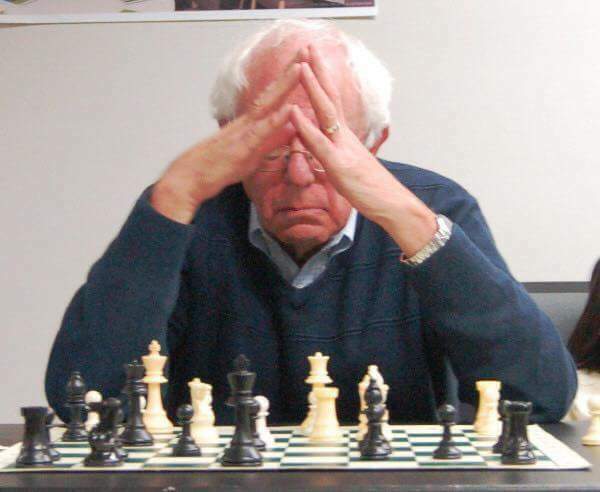 Bernie is still in it to win it! There you have it. Now is not the time to quit, whine or throw a temper tantrum. Now is the time for all good Berners to get on their feet and march in protest and solidarity--in Philadelphia, your city, your neighborhood, anywhere you can make some noise and let the world know that #WeThePeople have spoken. 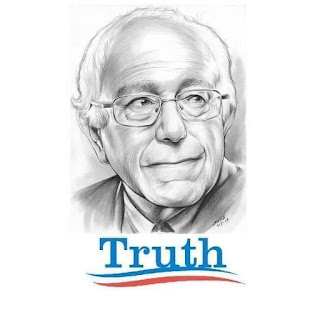 #OurRevolution has begun and it will continue until we've brought about the progressive worldview that Bernie Sanders and all of us believe in. A future to believe in. Now it's time for a "pep talk" and some words from two wise Bernie delegates on the eve of the convention. It's time for a pep talk folks. At the beginning of this election season, we saw a lot of new voters calling for a political revolution. The number swelled and then more people jumped on the "political revolution" bandwagon. Hope was in the air, and we had a candidate we actually believed in. Times were good. Then here comes the Sanders endorsement of Hillary Clinton. I saw a lot of people who were “the happy revolutionaries” all of a sudden fell into a fit of sadness or anger. Some actually said they would vote for Donald Trump. To say hearing a progressive say this is mind-blowing would be a profound understatement. 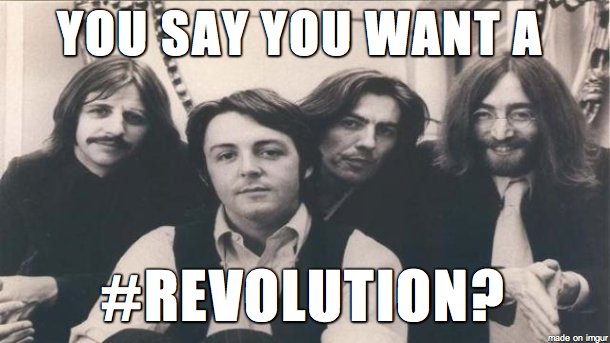 Welcome to the real revolution. 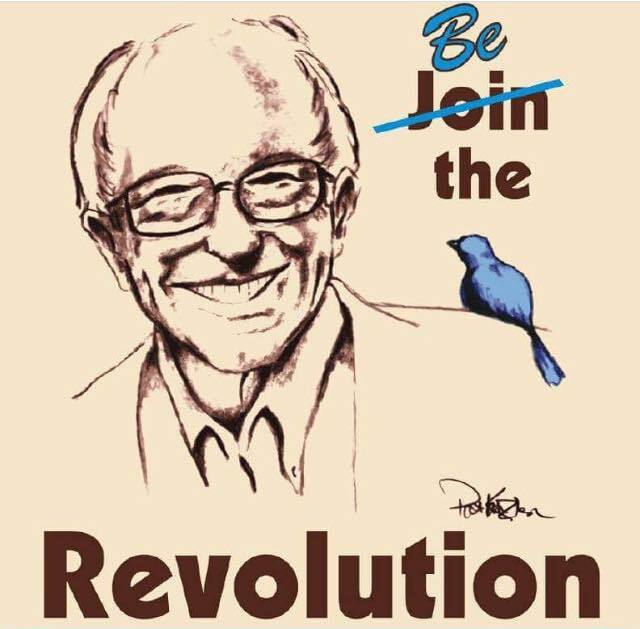 I have said repeatedly that this is not a Bernie Sanders political revolution. This is our political revolution. Yet at the first sign of adversity you quit. You go home. You say you'll vote for Donald Trump. If no one has said this to you, let me be the first: Political revolutions are hard. They are riddled with a lot of tears, frustration and heartbreak. 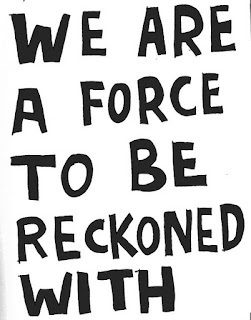 No entrenched power ever surrenders it willingly, and it sure as hell won't do it the first time you raise your voice. If you thought that political revolutions would come quickly and easily then you are insanely naive. I don't usually speak about myself, but in this case, I will make an exception. I'm no spring chicken, and I have voted third party for over a decade. I did so because I think that you should vote for a candidate not against one. I thought that I was the only one willing to do so in spite of popular thinking. Then along comes the Bernie Sanders campaign. For the first time in my life, I register as a Democrat because the platform he espoused is closer to mine than any candidate in the major parties has been in my lifetime. And, for the first time, I wasn't a single voice in a crowd but a chorus of many. Please note, I changed for the platform. 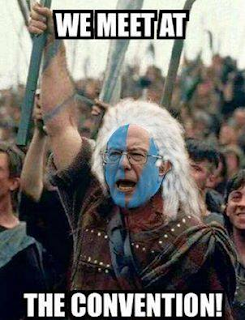 And now that Bernie has officially thrown his weight behind Hillary guess what I'm doing? 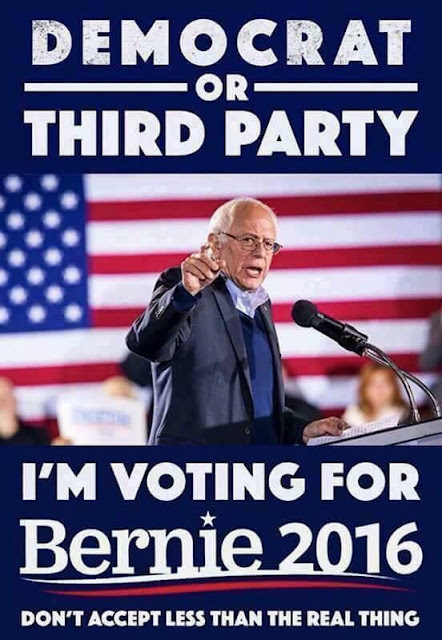 I'm voting third party--again. Meanwhile, so many of those who claimed to want a political revolution are now ready to throw in the towel. I'm not. And I won't be until I'm in the dirt, and even then If I could I'd fight on. I respect a people who will stand by their principles and fight for what they believe. I respect the people who fought for gay rights, civil rights, women's rights and other worthy causes not because it was easy but because it was right. Yet some so-called "political revolutionaries" who like to point to these people as their inspiration are so eager to say, "Screw it! I give up!" The people who fought for and won equality didn't give up. Oh, and they faced arrest, water hoses, bullets, attack dogs and bomb threats. Some of you are willing to give up over a setback. Some of you think that this fight can't be won. You're wrong. It can be won, but we must persist. So, to those of you who are throwing in the towel right now, I ask you "Who are you?" Are you the person who is willing to stand for something, or are you the person who quits when the going gets tough? You say you want a revolution, but do you really? If you do, then prove it. Don't quit. Fight for it and keep fighting. Vote third party. Write in Bernie if you want to, but for crying out loud take a stand. And now a word from two Bernie Delegates from Ohio's 5th congressional district. In the calm and centered moments, when the noise and chatter of the race is distant, quietly we sit and envision President Sanders there in the oval office with his warm welcoming smile. There with his razor focus on the progressive agenda. Just hold onto that vision for a moment. The rest is details. Details nature herself will take care of. And yet, we act. We go forth knowing that nature is on our side. Behold the transformation. For the nature of the times is with Bernie Sanders. Global warming with its droughts, floods, melting ice caps, record number of climate refugees, is calling out like never before for a close to the fossil fuel era. Only Bernie's message holds any hope of ending the carbon based energy supply. Shrinking of the middle class, economic strain on college graduates, urban youth and working families, and the massive shift of wealth to the very few is unsustainable. 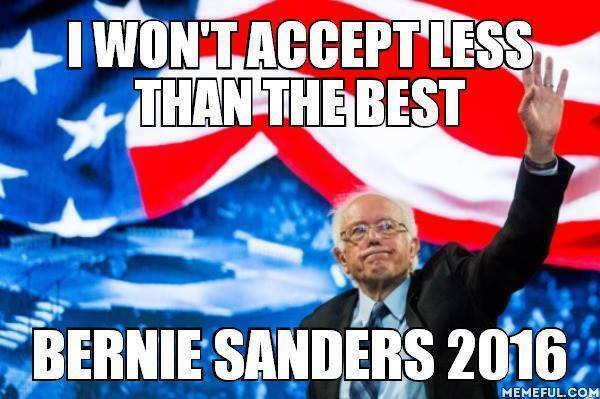 Bernie's voice is loud and clear and gaining more and more support. The message not a fad, it is the truth. 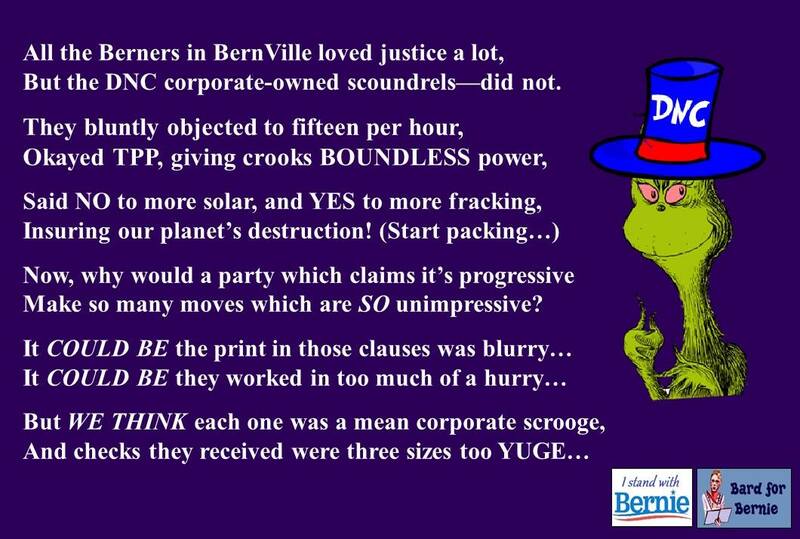 On every issue, from fracking, TPP, single-payer health care and college education, the truth of an unsustainable corporate-dominated system is coming out. Only Bernie's message offers remedies. Here is the evidence that people are ready. It is contributions from the seven million in small amounts that fuels the campaign. It is a massive grassroots operation, like never seen before, getting thousands of people politically engaged. It says the time is right for the transformation. 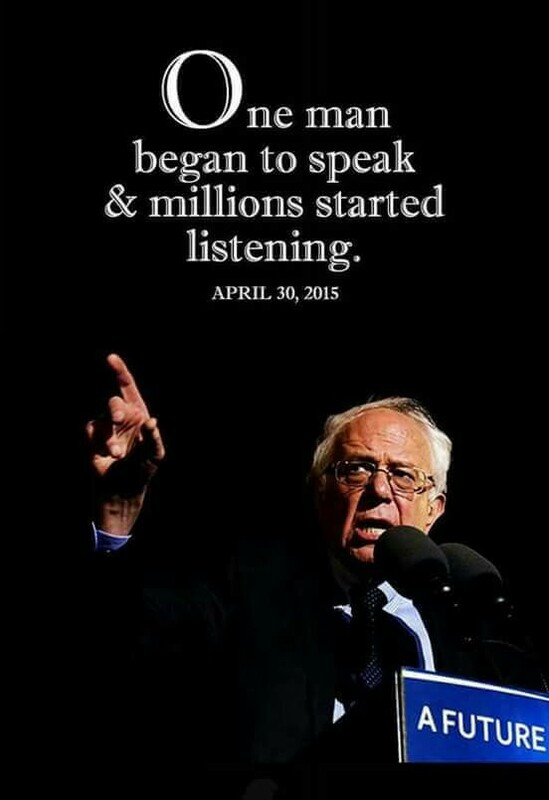 At evermore popular rallies, the message resonates over and over, reverberating between Bernie and audience like masterful music. And Bernie rolls on as the great conductor of the trends of time. I am inspired to resonate with Michael Grom, Ohio 15th congressional district Sanders delegate when he says, "Truth is on our side. There are millions of people along the east coast within a short distance from Philadelphia. We can turn this convention around." Michael and I share this quiet vision of Bernie in the White House. This is why we are to keep clear in our centered moments the transformation is the need of the times; we create it with our thoughts and intentions. Not to mind what media says, the real news is that we are the future as we envision Bernie Sanders in the White House. The rest is details. We attend to them and carry on his message. 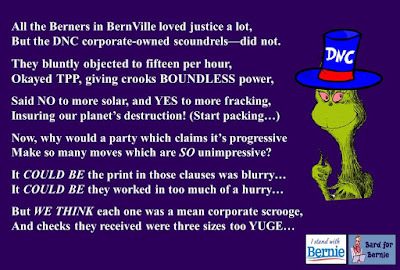 And now a word from The Bernie Blog co-founder and Ohio Bernie delegate Barb McMillan. Bernie has not lied to us. Fifty years of putting himself on the line for his fellow human beings. How dare anyone berate his efforts. From the beginning he made promises, among them that he was going to run as a Democrat and not be a spoiler. This was the conclusion. He was not going to destroy the party and he was not going to berate HRC. He was pushing the progressive agenda and trying to open the party to the progressive future. He continued to fight after the votes were in, after his colleagues spit on him, after exhausted each day he fell into bed to start again. He has asked for a roll call at the convention. We need to have a show of our strength. We need to say from the inside of that convention center we are here! In numbers. A coward walks away crying, "They cheated." A courageous man says, "They fought effing hard, and we still have a chance to forward our goals." I'm standing behind this man. His work has been heroic. He holds his head high. So do I. We'll See You in Philly! Check out our "March on DNC--See You in Philly" page on the sidebar for other helpful links. Now, get yourself psyched up for the convention with this great anthem. We're still standing and we're #StillSanders. #FeeltheBern everyone. 7/12/16 Editor's note: Yes, we've changed our banner photo and the title of this blog. We're now "Our Revolution Continues -- The Bernie Blog." We will continue providing insight and news on progressive candidates, issues and topics. 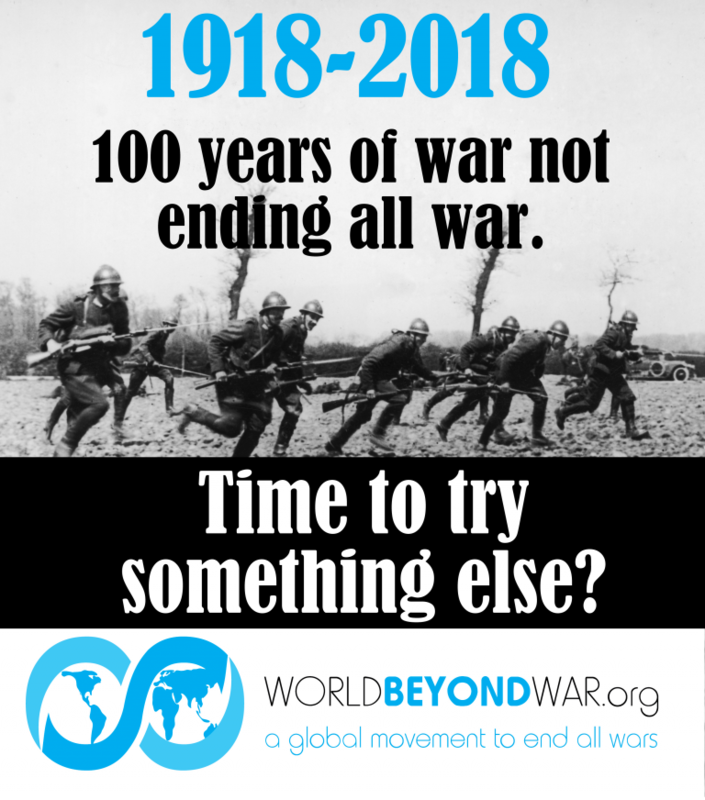 Thanks for reading and sharing the blog with others, and please consider submitting your thoughts to us for publication. We want to hear from you. Our mission remains the same--only the name has changed. And we are still listening. And our society. Two more black men were killed by police this past week simply for being in the wrong place at the wrong time, confronted by the wrong cops. According to The Young Turks, 136 Black lives have been taken by police action so far this year, and African-American teenagers are 21 times more likely to be shot by police than whites (data gathered from 2010-2012 FBI statistics). Only days later police officers were shot and killed in Dallas after a peaceful protest about the latest cop killings. Corruption pervades the very fabric of our justice system, a system which metes out violence to fill its private prisons to make obscene profits for its stockholders... A system in the halls of Congress which openly doles out money from the gun lobby to our representatives without a thought to the lives taken by homicidal individuals carrying military assault weapons on our streets. A system without morals, without mercy, and without even the decency to acknowledge #BlackLivesMatter. There were four Latino lives taken by police this past week according to TeleSUR with little or no mainstream media coverage as well. Our corporate media conglomerates see no profit in documenting non-white deaths. Profit is to be made solely by spinning endless drivel about the electability of a certain racist GOP candidate and his wall, a wall which symbolizes the perverse division between our actions and our humanity. Can there be any doubt that (to quote George Orwell's Animal Farm) "Some animals are more equal than others" in our messed up society? Our thin veil of denial is gone. 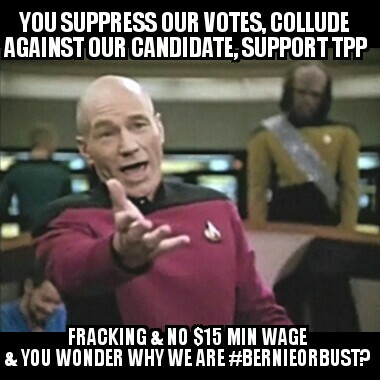 With Bernie's leadership, we know these harsh truths to be real, and we are empowered to speak out about them. We can protest these injustices in the streets of Philadelphia. We can bring about change by passing new laws and insisting our government enforces the good laws already on the books. Because we know that no one is above the law, and we will not rest until morality and common decency has been restored. We are staying the course. 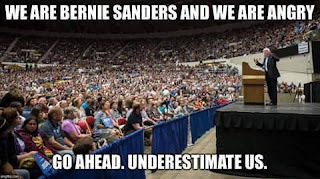 We are standing by our chosen candidate, Bernie Sanders. We are not blindly accepting corruption. 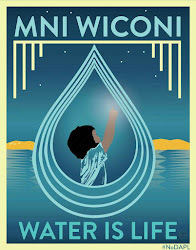 We are fighting for justice--justice for all and not only for "some." You know, there are moments when I really hate being right. This is one of them. I hoped that I would be proven wrong and would have to eat my words. Nothing would have made me happier than to say I was wrong about Hillary Clinton not being indicted over the e-mail fiasco. Unfortunately, I'm proven right again--much to my dismay. I'm certain that a number of Clinton supporters are dancing in the streets right now. Hillary herself is likely breathing a huge sigh of relief. While they may celebrate, they may not understand what the significance of this decision is. And the text on the front of the Supreme Court. The key to all of these references is applying justice equally, fairly and without prejudice. We have seen numerous times where the wealth and status of an individual has protected a person from repercussions that would be faced by an average citizen without the same means. These two have little in common outside of wealth and status. An average citizen would not be able to afford a robust defense that would get you an acquittal considering the evidence at hand. This case is worse because it will never enter a courtroom. If this was an average citizen who had 1/100th of government related e-mails she had, classified or not, on a private server at their house, they would have been slam-dunked months ago. Instead, we have a highly influential politician who not only avoids facing jail time but avoids going into a courtroom. I'll point back to the references I made at the beginning of this post. 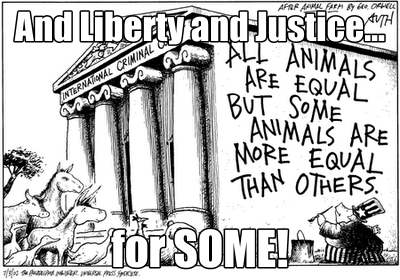 The common theme in all three references is that justice is supposed to be applied equally--to everyone! Yet because some Clinton supporters (and others) treat elections like it's a professional sports franchise, they are willing to grant a pass because they think it works in their favor. This shortsightedness sets a new precedent. First, any person who at any point has a spill of government information can point to the Clinton fiasco and argue for the case to be dismissed. 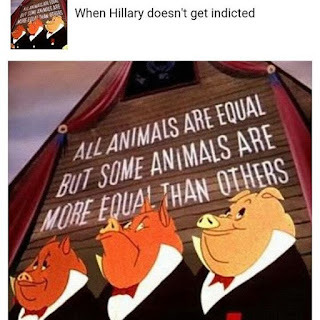 They will say, "Clinton had tons more information than I did, and she got away with it. I should be excused." That removes the consequences for protecting any information. And you can bet that any smart lawyer will use that to their advantage. Second, it reinforces the mindset of "Do as I say, not as I do." Politicians are supposed to be public servants, not lords and ladies immune from the consequences of violating laws. Not only that, but now they have the mentality that they can do so brazenly and in the open without consequence. Yet if you do the same thing, there will be hell to pay. Once again, America’s greatest export--the double standard. On my profile, I have a paraphrased quote from George Carlin. It says, "It's a big club, and you ain't in it! Oligarchy!" It is not a random quote, but it is an accurate representation of the current state of affairs in our nation. Oligarchy starts small and stays in the shadows out of fear because they know that if the people wake up it's all over. Over time, it grows from being fertilized by indifference and apathy. Now it is completely out of hand. There is no fear. They do what they will because they think that people are too stupid to do anything about it. Make no mistake, this is not about left versus right. This isn't about bathrooms or parties or faith or any other wedge issue that they use to divide us. It's about "The Oligarchs" versus "Everyone Else". Working class citizens need to look beyond party labels. We need to be aware and make others aware of what is staring us right in the face. This Woman is Bernie Strong! Should he win or not, Bernie must stay the course. To continue the leadership toward change. The rhetoric will change,but we need the assurance that he is a leader no matter the decision. Many leaders did not get the first round; but I for one am encouraged to finally feel like there is hope. I am one of the working poor, retired now on Social Security, but I was a single mom that raised my children with the right stuff. And I see this in Bernie. I have been a Democratic voter for 40 years and shared this important choice and action on our part. But I am also aware that change can be slow but with dedication and hope-- and work--it can be done. 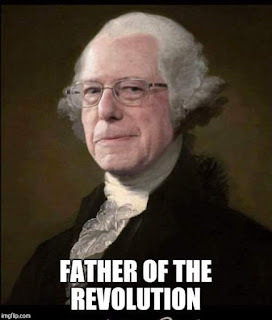 Bernie Sanders: I will vote for Bernie if he runs as the Green Party candidate! Do you hear the people singing in the streets? You will in the City of Brotherly Love. Enjoy the video below and sing along. We the people are strong. Feel the Bern! It's #OurRevolution and it has begun. Celebrate! Just as our forbearers declared themselves free from Great Britain 240 years ago, this year we declare ourselves free of the corruption and divisiveness of the oligarchs' two-party system. 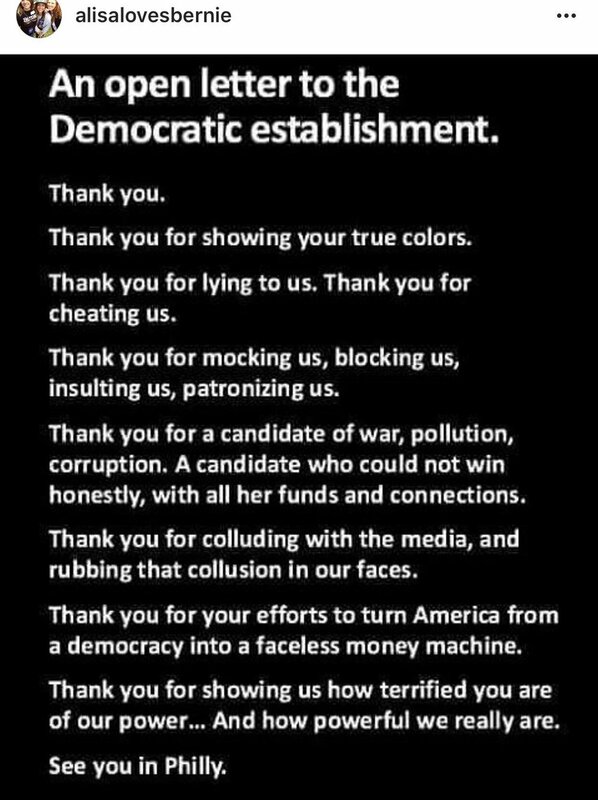 We are free to express our sense of outrage at the outright election fraud and voter suppression tactics employed by establishment politicians who care more about their Super PACs than their constituents. We are free to join together behind a banner that claims we all have "a future to believe in" and not a tomorrow of fear. So today as you light your fireworks, eat your picnics and sing patriotic songs, don't forget to cherish your rights of independent thought and action. Cherish the gift we've been given called Bernie Sanders and his political revolution. Vow to make the pilgrimage to Philadelphia in a few weeks to where our first representatives sat and contemplated the costs of breaking away from the mother country. Vow to raise your voice against the injustices of the corrupt DNC. United in numbers we are strong. Let 2016 be our new year to celebrate our freedom from tyranny. Let it be the last year we tolerate "politics as usual" and voter apathy. Berners are here to stay. We'll be filling the halls of Congress and ours state house soon. While Berners stand united in Philadelphia in their support for democracy untainted by corporate greed, others will attempt to divide us and set us against each other. We must stand firm. Remember the chant heard during the Democracy Spring protests: "A people united will never be divided!" 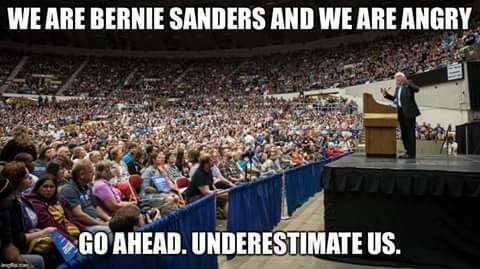 Stand strong, stand firm and we'll #SeeYouInPhilly. The more the People and Bernie Sanders succeed, the more the Democratic Party screams for “democratic unity” behind the establishment candidate. I don’t know about you, but I think the establishment could use an education about what “democratic unity” means. If the establishment were really fighting for democratic unity, the party would be rallying behind the candidate who united the People, not trying to rally the people to unite behind the party. To change a broken system, we have to address the root of the problem. Senators and members of Congress refusing to do their jobs, the DNC promoting their own agenda, and corporate money in politics for starters. This country isn’t being run by elected officials protecting the rights of the people. It is being run by big corporations paying off members of Congress to pass policies that contribute to massive profits for the top 1%. This is far more than just a presidential election. 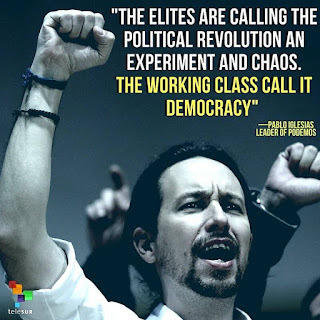 This is a revolution to recover the democracy the establishment stole from us. This week, I asked a member of Congress how the People can help change a system that refuses to hear proposed policies that protect our constitutional rights. That’s a tough one? In other words, Don’t bother trying? Go back to sleep? The system can’t be changed? That is just not an answer I am satisfied with. I have a better one: Vote them out! No doubt it is going to be tough to eliminate a system of corrupt politicians. It is going to be tough to change an establishment that pursues its own interests over the interests of the people. And it’s going to be tough to change a corrupt election process that denies millions of registered independent voters their constitutional right to vote, despite the fact that the primaries are paid for with tax dollars. Statistically, if independent voters were included in the process, it’s likely the lead would be firmly in the hands of Senator Bernie Sanders. Despite the current “lead” Hillary Clinton has in the delegate count, she will not be able to clinch the nomination prior to the convention. The people have spoken--at least the people who have been allowed to participate have--and Bernie won state after state in the primaries. Millions of people cannot be ignored forever. Despite the best efforts of the establishment and the mainstream media to do just that, the Political Revolution is getting stronger. Last I checked, ignoring a problem doesn’t solve the problem. Our democracy has been stolen from us. We want it back. See you at the contested convention. Bio: Suki Liebow has been writing on the topic of emotional processing for over 20 years, and is preparing the release of her first full length book. Suki founded a unique method of emotional processing that facilitates productive communication leading to more successful relationships. 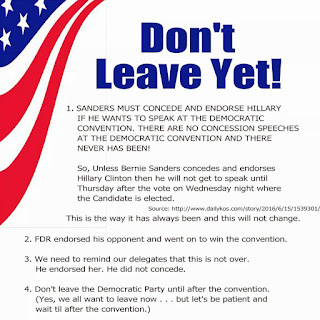 The DNC convention looks like it will be contested--or at least contentious. The FBI interviewed Hillary Clinton on July 2 about her easily hacked private email server. Keep your fingers crossed we hear of her indictment before July 25, and Bernie Sanders will be recognized as the honest public servant he is. We'll celebrate a Happy Independence on that day, free from corruption and bought-off politicians! Bernin' up the Road for Bernie! 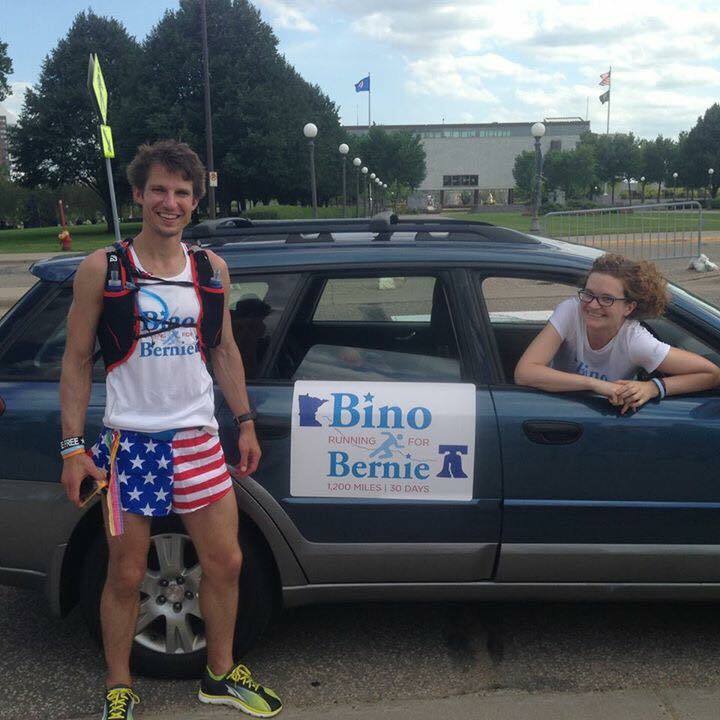 •An interactive map of my route and dates when I am stopping at various cities/town in MN, WI, IL, IN, OH, and PA: https://www.facebook.com/BinoRuns4Bernie/posts/185831535148482 - I still need supporter housing at some of those places. Thank you. We hope to see you in Philly. 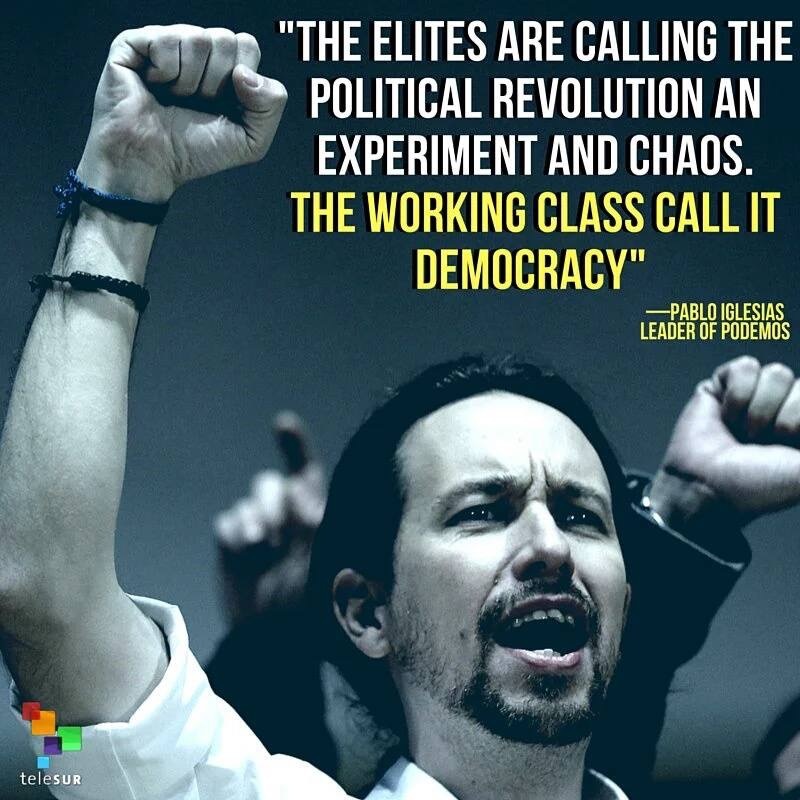 Our Revolution has begun!